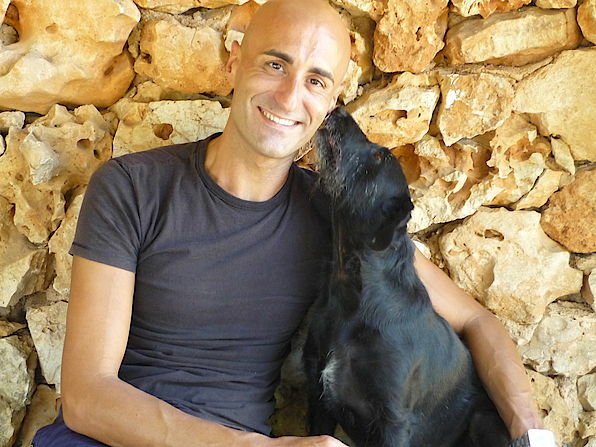 DAILY BULLETIN MAJORCAS „Dog WHISPERER“ Majorcan dog behaviour expert Jose Arce will not be able to help those who give up on their new furry members of the family in the New Year, occasionally with tragic results, but he can help those who eventually suffer difficulties with their pet. So successful is Jose with his unique approach, he has become known as the “dog whisperer” by the scores of dog owners of all nationalities he has helped on the island over the past two years. Jose has been fascinated and interested in animals since a very young age but he claims that when he was aged eight, he realised that he saw animals in a different light to most people. He was particularly interested in their behaviour and initially wanted to channel that into a career but there were no suitable courses. EUROPE “I neither wanted to be a vet nor a dog trainer but these were my only options,” he said. So, he became an air steward and for 12 years, combined being a chief air steward with his passion for dogs. “I was always helping my friends who had problems with their dogs and, as I was flying all over Europe, I even ended up helping people in Germany and the UK, as I came into contact with more and more people and being able to speak English and German has also helped. “Then, I decided to quit my job at the airline and dedicated myself to helping dogs and their owners,” he said. Jose’s approach is unusual and unique but makes perfect sense. For those who have watched television programmes like Super Nanny, for example, Jose’s methods will appear somewhat similar. His principal concern when called in to help correct a dog’s behaviour is to study and examine the pet’s surroundings, its owners and how they look after or treat the dog in question. He also uses some of his five dogs to help on occasions. “The first thing I look at is the dog’s environment. Sometimes it can take a matter of hours to resolve the problem while on others, it may take days. “In extreme and more difficult cases, I will take the dog away to my house for a few days,” explained Jose. “The problems dog owners have with their pets are often the result ofa lack of knowledge about the animal itself,” Jose says. “If every dog owner tried to look at the world through the eyes of their pets, they would get a much better picture of what a dog needs and how it should be looked after,” he adds. One thing Jose is very keen to stress is that dogs are pack animals and that they need leadership. “Dogs are pack animals and that is the main reason why humans are able to establish such a close bond with them. “A dog needs leadership to live. Dogs are used to living in groups, packs, they’re not used to living on their own. PART OF THE PACK “If a dog is allowed to become part of the owner’s pack,like the family for example, then its behaviour will improve significantly. “It will act in the way in which it has been shown by its owner - it will behave,” Jose explained. “But a dog needs time to get to know its leader and its position in the pack and this development requires a great deal of effort from the dog and its owner,” he said. Jose explains that feeding and walking of dogs are two good examples. “I advise my clients that dogs should be walked before they are fed in the morning. “As a pack animal, it would be quite normal for a dog to go out in search of food every morning so, dogs should be walked before they are fed. “It’s not only more natural for the dog, it is also an important leadership exercise for the owner and leads to a better relationship between the two. “I have come across cases where the dogs are showered with kisses and cuddles every morning and then fed with their exercise coming later. “This is sending out the wrong message,” Jose explained. What Jose make blatantly clear is that taking on a pet dog requires a great sense of responsibility. “When considering the option of having a pet, people have to remember that the dog will be with them for as long as 12 or 15 years. “It has to be walked at least twice a day and can’t be dumped on friends or families when owners go on holiday. They are part of the family and need love and discipline, just like a child does. “Also, when choosing a dog, I advise people not to pick a dog which has more energy than they do and, as I’ve said, they clearly need to be shown who is boss,” he added. “Depending on the breed and genetics, dogs which are constantly left alone or live in a kennel will develop fearful behaviour of worse, they can become aggressive. “I have dealt with many cases of dogs which, after six or seven years for example, have suddenly become aggressive. AGGRESSIVE “In many of the cases, the animal has not suddenly turned aggressive but has probably been living an unhappy life and been growing increasingly frustrated for many years so, in fact, the sudden snap in character is the fault of the owners who have not treated the dog properly. “Even dogs left to their own devises in a large garden are quite often unhappy. “They need to be taken for a walk, they need to be accompanied by their pack leader, they need that bonding. Quite often, a dog kept in a city centre flat leads a better and healthier life than a rural pet because the pet and his owner will go out together at least three times a day. The pet will have a regular routine which it will understand and know how to interact with and also develop a strong bond with its owners. “Dogs enjoy nothing more than being taken out for a walk, accompany their owners on their errands, going to the shops, seeing friends, it makes the dog part of the pack, it make the dog feel whole and content,” Jose explains. “I have plenty of room for the dogs to run at home but I still take them all out for walks every day. “We have to remember than dogs see things completely differently to us and when they’re being led around town they need our help, assurance and guidelines because they don’t understand much of their surroundings. “When people are considering taking on a dog, it is also worth taking into account what activity the breeds were originally bred for. “Traditionally, every dog had a different role such as herding sheep, fetching shot birds or hunting, for example, and this needs to be taken into account with regards to the new environment the animal is going to live in. These are the kinds of things I hope many of the people who bought a pet for Christmas considered and will take seriously as they set about bonding and training their pet to become a member of the pack and behave.” Jose is also working with many of the animal shelters on the island, especially rehabilitating aggressive and violent dogs and those which have been maltreated.